"Let visitor bookmark your site with just 1 click"
ORDER BONUS: Order now and receive resell rights so you can sell Easy Bookmark and keep 100% of the profits! Easy Bookmark automatically adds your site to their browser favorites (Internet Explorer) with just one simple click. With Easy Bookmark you can instantly add a "bookmark us" link to your web pages. 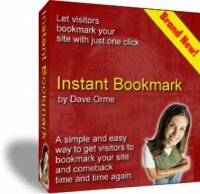 Easy Bookmark does all this and more….. When you order today, you’ll also receive the resell rights, along with the web page and graphics so you can sell Easy Bookmark on your own site. Make just one sale, and you've paid for your investment! GUARANTEE: If Easy Bookmark is not everything that we say it is and you are not completely satisfied with it, then we will refund every penny of your money with no questions asked. P.S. Don’t forget, you receive resell rights to Easy Bookmark when you order!